Is Your Lifestyle In Harmony With the Care of Your Life-Force? The Care of the Life Force, its replenishment, conservation, free flow, and the equilibrium of its modalities was a subject of a recent G+Hangout. The Life-force is the vehicle of energy that powers the activities of our physical body and our mind. Obviously, then, it is the force that enables the activities of our physiological mechanism (digestion, circulation, etc. ), the outer functions of the physical body (walking, running, talking, dancing, etc. ), the thought processes of the mind (reasoning, thought association, remembering, imaging, verbal thought formation, etc. ), our emotions, sensations, perceptions, and desires. It is also the energy that is at the basis of our psychic functions. All of life is about doing. We are all always doing something, always trying to attain, achieve, acquire, sustain or dismiss something. It’s all about action. While our physical body enables us to act in the physical plane, it is the life force that animates the physical body i.e. the life-force is the real vehicle of action. It is a living entity that is made up of electro-magnetic and other subtler forces. Death, for example, is the separation of the life-force from the physical body. Without the life-force, the physical body is just a lifeless aggregation of molecules and atoms. Quick example: When we want to move our hand 1) we begin with the will to do so. 2) this intention is given form by the mind as a verbal thought or an image of the intended act. Next, 3) the image or the words mobilize the life-force which 4) in turn, (working through the nervous system) moves the hand to carry out the act. All due to the life-force. Its replenishment is optimized by observing proper dietary principles; by following a very nutritious and wholesome diet. It is conserved by exercising moderation in eating, drinking, sexual activity, work, emoting, sensual gratification of all kinds, etc. Its free flow throughout the body is secured by judicious and periodic fasting, the practice of cleansing breathing techniques, and a lifestyle that is free of emotional suppression. The life-force is subject to a cyclical alternation of phases in which it heats and dries the body at one extreme (fire), and cools and moisturizes the body at the other (water). In between these are the cold and dry (earth), and hot and moist (air) phases. Excess or deficiency in the generation of any of these modalities results in illness and psychological problems. 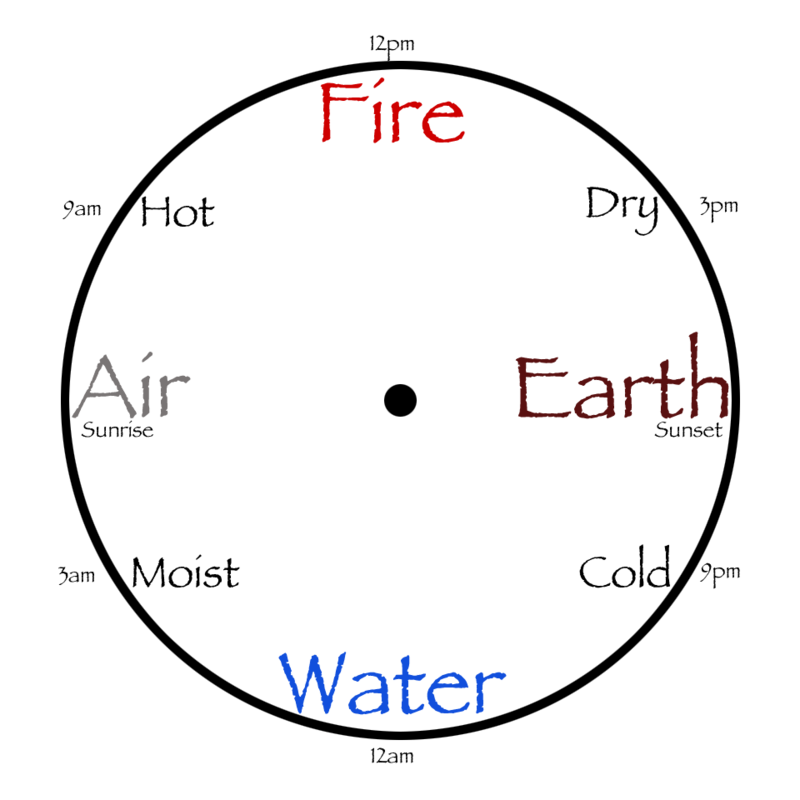 The equilibrium of the four modalities of the life-force is achieved, first of all, through living in harmony with its cycle as shown in the picture. Main Objectives: Raising the fire to its optimum, and taking advantage of it by scheduling those tasks that require great effort of the will, courage, and ambition. This is the point were the body’s heat is beginning to rise above its median point, and its moisture is still supportive of heavy bodily exertion. Although other factors coincide to enable the body to reach its peak exertion towards the late afternoon, this is the best time – taking the whole into consideration – for aerobic exertion. The heat generated, besides aiding the body to meet its physiological demands, provide the brain with the fire to carry out our will, especially in the areas of enterprise, behavioral change, difficult decisions, self-employment, dealing with difficulties, and so on. The best time for eating dinner is between 1:00 and 3:00p.m. The accumulated heat of the body lends good support to the digestive process. The period of 3:00 to 6:00 p.m. is the time to engage in lower intellect (syllogistic logical, and technological) activities. From 6:00 to 9:00 p.m. the energy of the body is best suited for the pursuit of the higher mental activities; analysis, synthesis, and intuitive inquiries. If needed, a light supper may be taken around 6:00 p.m.. Note that this is the time that most people, because of the economic schedule of the contemporary world do their heaviest exercising. Exercising so late is disrupting to their health as it raises the body temperature and the activity of the thyroid when they are naturally scheduled to go down. The latter will interfere with the depth of sleep and its functions (regeneration, healing, revitalization, etc.). Main Objectives: Taking advantage of the remoistening and cooling of the body by scheduling meditational activities at this time. As the body cools and regains its moisture, our psychic receptivity increases. You should meditate about 9:00 p.m., retire to bed around 10:30 p.m., and wake up at 3:00 a.m. for another meditation session for about 15 – 30 minutes, if this can be accomplished without problems in falling back to sleep. In this manner, the subject of meditation will be vigorously worked on during sleep by the subconscious. It will also affect the content of your dreams, and increase the ease of their interpretation. The relationship between what is dreamed and the meditation will always be clear. The body’s heat and moisture cycle tends to follow that of the earth which heats up and dries out with the rising of the sun, and reverses with the setting. People who sleep by day and work by night, work against this natural rhythm of the planet. That is why night workers suffer a higher incidence of illnesses, accidents, commit more mistakes, and so on. These facts argue strongly against the belief that some people are by nature ‘night owls.’ We should not be surprised to find that many people have their bodily, cycles, and functions perverted by the host of ills from modern living.